Comet 212364A. 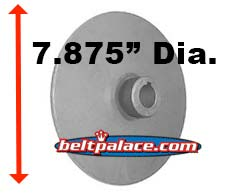 7-7/8" Diameter Brake Disc. 1" Bore, 1/4" key. Comet 212364A. 7-7/8" Diameter Brake Disc. 1" Bore, 1/4" keyway (no set screw required). Approx. 1/8" thick not including Hub. Sold as package of ONE (1) Disc only. Caliper brake assembly sold separately. 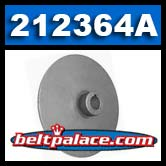 Comet 212369A Caliper Brake System Disc: 6-3/8" Dia., Hub w/ setscrew, 1" Bore, 1/4" keyway. Comet 218198A. Set of 2 replacement Comet Industries Caliper Brake Pads #218198-A. Comet 218198A. Set of 2 replacement brake pad pucks for Comet 218070A Brake Assembly. Comet Industries Caliper Brake Pad Set Part: 218198A. Comet Industries 218070A Disc Caliper Brake Assembly. Murray Disc Brake Assembly Part 680287. OEM Replacement for those used in SALSCO GREENS ROLLERS.